Since 2012 Coffin Turbo Pump has initiated the development of a motor driven pump. Due to the development of high-speed motor technology the same advantages of our pump-side remain: reliability, compact and light. For customer’s seeking a motor driven Coffin Turbo Pump, these are available in various configurations: direct coupled, closed coupled or gear-driven coupling with a variable frequency as optional. Please find all specifications for a motor driven Coffin Turbo pump below. 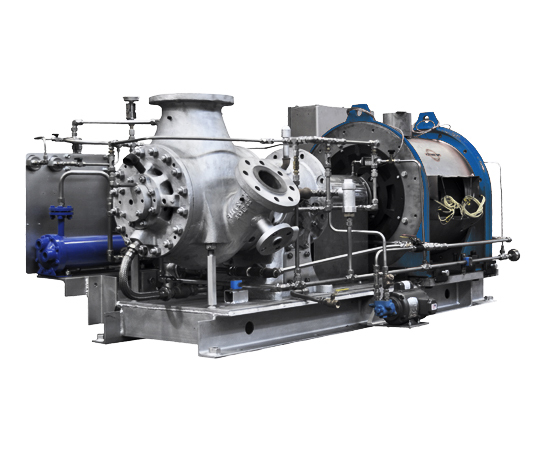 Boiler Feed Pumps (BFP) are an essential part of a steam turbine power plant. BFP re-deliver water received from the condenser back to the boiler. A constant flow of circulating feed water is essential for boiler operations and steam generation. BFP service and operating conditions are both critical and challenging: high pressure application, delivery head, high flow rate and water temperature, varying load demands and plant process-interruptions are common denominators.